A date for your diaries – (You’ll be having your) Tea in the Park will take place as usual on the first Saturday in September – this year Saturday 2nd from 2 to 4.30. This year’s attractions include the Edinburgh Bootcamp which comes with Obstacle Course and children’s games. The Vikings of Din Eidyn will be out in strength this year with a full battle force as well as other Viking pursuits. 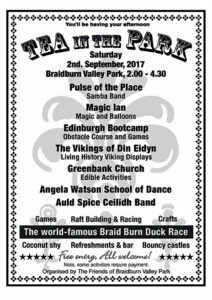 Pulse of the Place, Magic Ian, Auld Spice Ceilidh Band and Angela Watson – School of Dance will entertain. Plus all the usual fun Crafts and activities, raft building and racing. Not to forget the Famous and Original Duck Race.